I owe this recipe to my five-year-old. 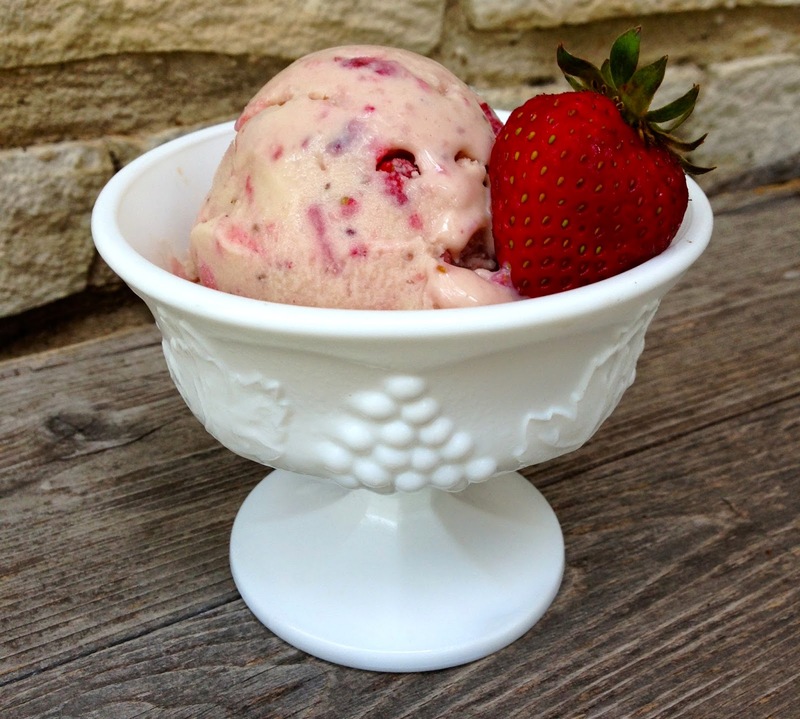 Yep, my kid suggested that we make "Honey-Goat Cheese Ice Cream with Strawberries." When he was really little, I would make him a snack with halved strawberries topped with goat cheese and toasted almonds, drizzled with a little honey. I guess he hasn't forgotten! Anyway, it was genius to turn this into ice cream. I'm so proud of my little man! He wants to go to cooking camp this summer, but I'm thinking he'd be better off teaching one! Goat cheese isn't decidedly "paleo" because it is dairy, BUT, some people with sensitivities to casein may find this more tolerable. If you are going to have dairy, goat cheese is sometimes the lesser of two evils. Why? I dunno, Google It! It's something about a significantly smaller amount of casein and lactose, and its natural homogenization, making it less processed than cow cheese. Plus its delicious. I love the tangy flavor of goat cheese. 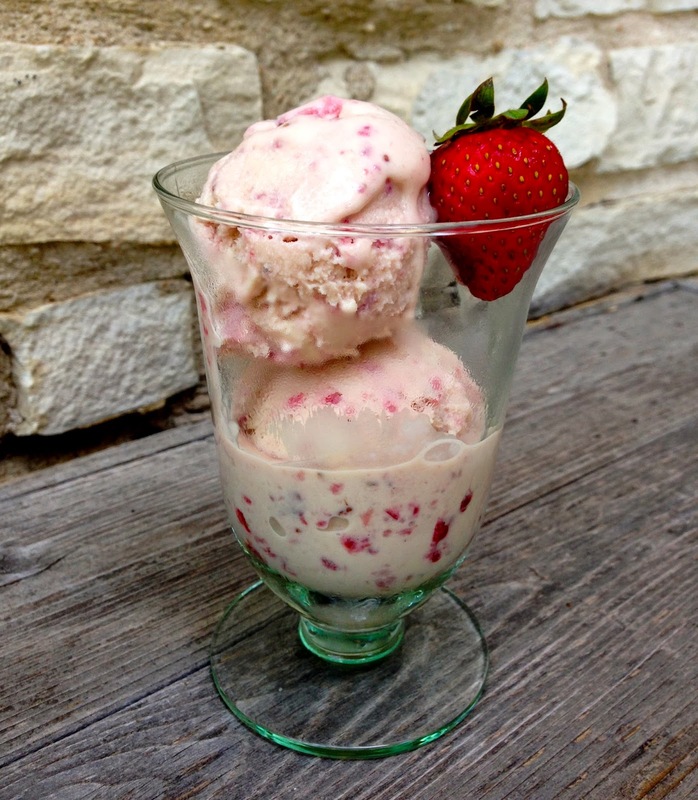 In this ice-cream, it is perfectly balanced out by the honey and sweet strawberries. I used almond milk in this recipe instead of coconut because the almond flavor is perfect with the rest of the ingredients. Sometimes coconut milk can be a dominating flavor, so if you can use almond milk, do. 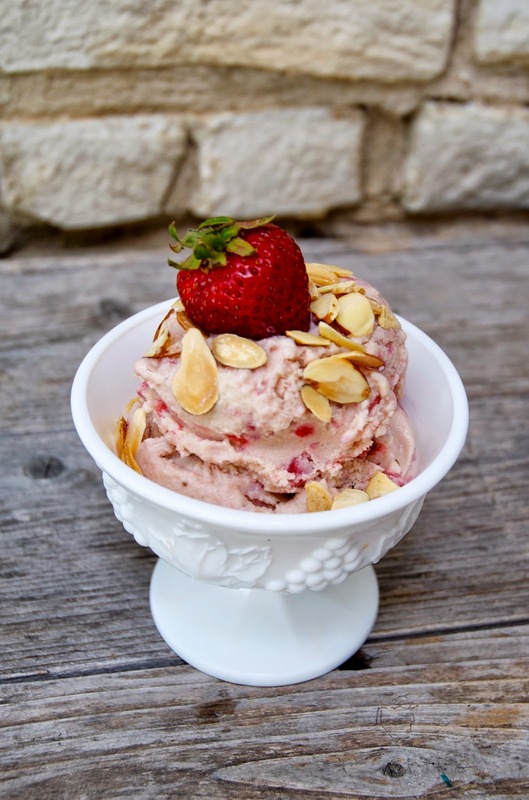 You'll need an ice cream maker for this recipe. I love mine-- It's a wooden Cuisnart version we got it for our wedding 6 years ago and it still rocks out. I highly recommend it! Heat almond milk and honey in a medium saucepan over medium heat. In a medium bowl, whisk the egg yolks, stevia, vanilla, almond extract and salt vigorously until the yolks begin to turn a pale yellow, about a minute. When the almond milk starts to bubble around the edges of the saucepan, take it off the heat. Now you are going to temper the eggs (heat them without scrambling). To do that, slowly pour about a cup of the hot almond milk into the eggs, while whisking constantly. Continue to whisk in the remaining almond milk. Pour the entire mixture back into the saucepan and continue to cook, stirring often, about 5 minutes. Strain the mixture into an airtight container and put it in the fridge. When the mixture is totally cooled (either 12 hours in the fridge or--I cheated--1.5 hours in the freezer), run it through your ice cream maker according to the manufacturer's instructions. 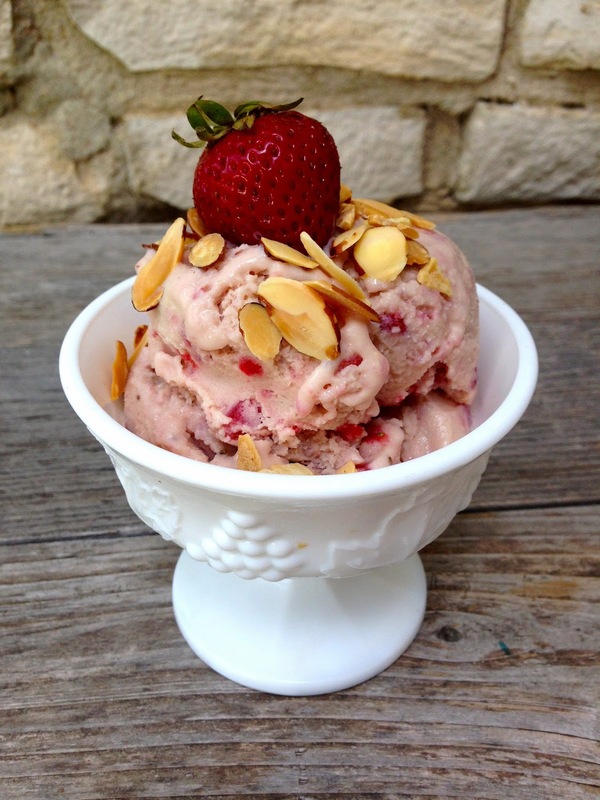 While the ice cream is churning, chop strawberries or roughly pulse in a food processor. 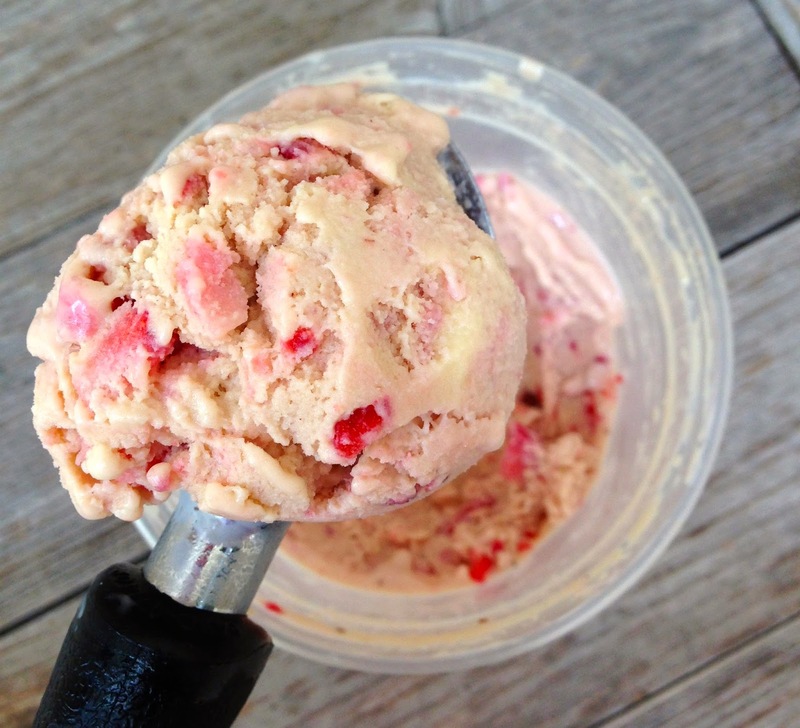 When the ice cream is about a minute away from finished churning, add the strawberries. Return the ice cream to its airtight container and freeze for about an hour before serving. Serve with chopped, toasted almonds! I am not a huge fan of ice cream, but I have found myself dreaming about this stuff all day. 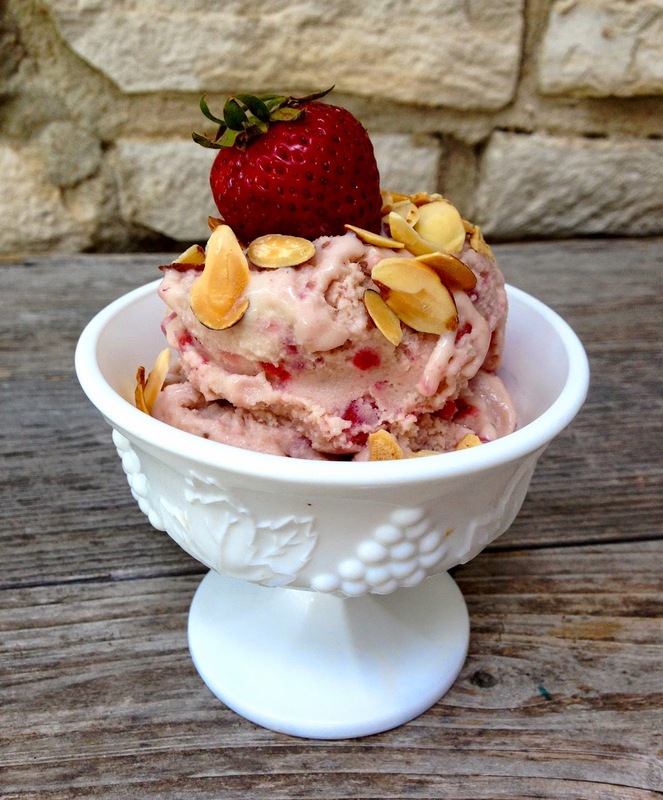 If you have ever made "paleo" ice cream before, you have probably been frustrated with an icy, grainy texture. This is not that. This stuff is unbelievably creamy. 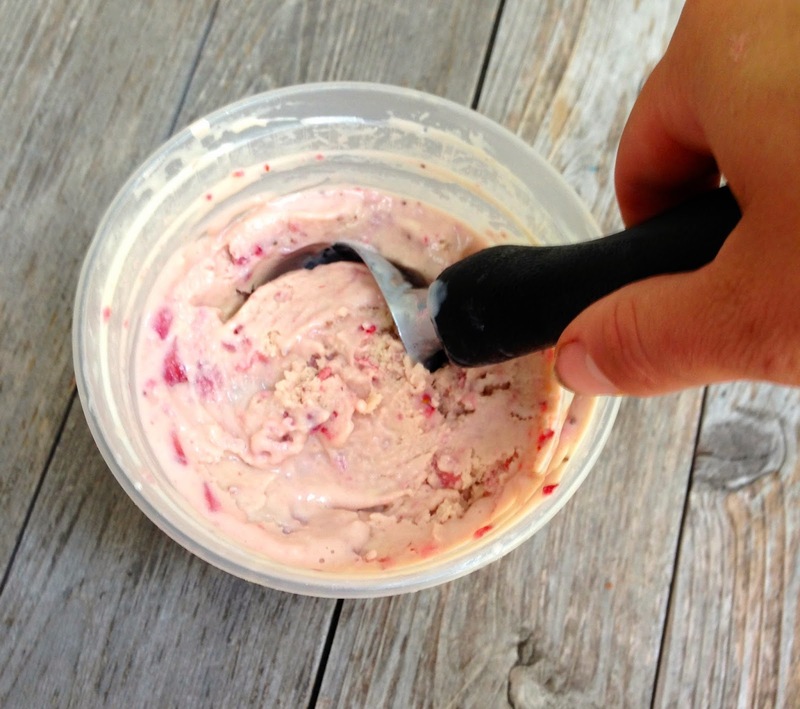 It kind of tastes like Jeni's, which is famous for its creamy texture. Their secret is cream cheese. Goat cheese apparently works just as well. July is National Ice Cream Month. After this successful experiment, I'm going to extract as many genius ice cream recipes out of my kid as possible. We tried out a pistachio-avocado recipe last week, but it wasn't that great. A swing and a miss. Oh well. Next up I think we'll try his favorite, mint chocolate chip. 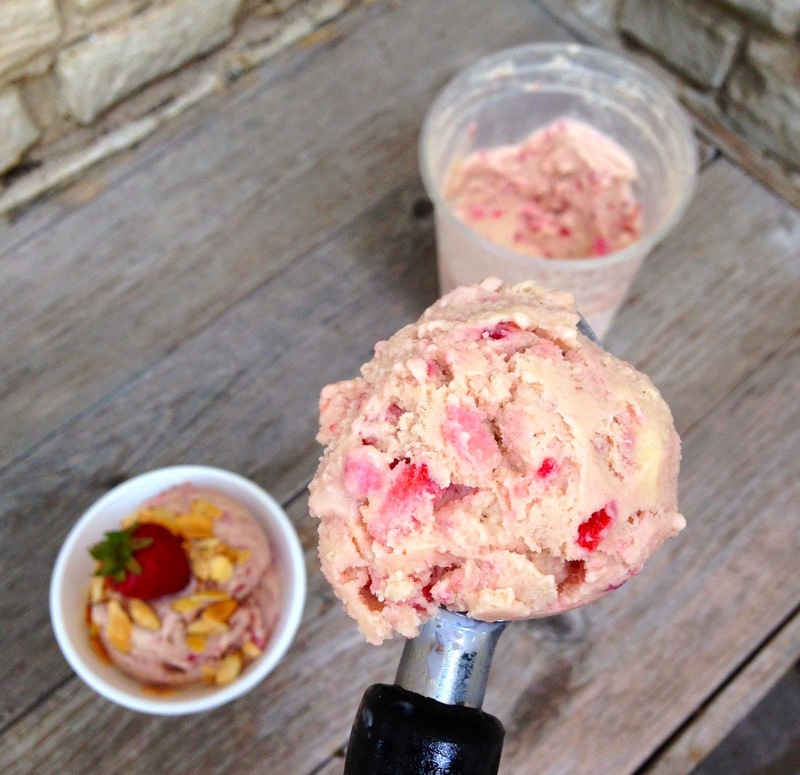 I want to try peach ice cream with some roadside peaches we pick up on the way out to my river house in Fredericksburg this weekend. What else? What's up with the song of the day? Someone asked me that the other day and the answer is this: I love how songs can really speak to how you are feeling on any given day. Some, in particular, resonate with my mood, what I'm going through, how I'm feeling, etc. Sometimes, it's just a great tune that lifts my spirits. Anyway, like yoga helps you connect your mind and body, I think music can connect your reality to your soul. It's socially acceptable poetry-- and I love it.